Please find herewith a Press Release that was sent to media a few weeks ago. It is our my way of extending a first invitation to Leonard Cohen Night, an annual event of poetry and song that is now in its 5th year! 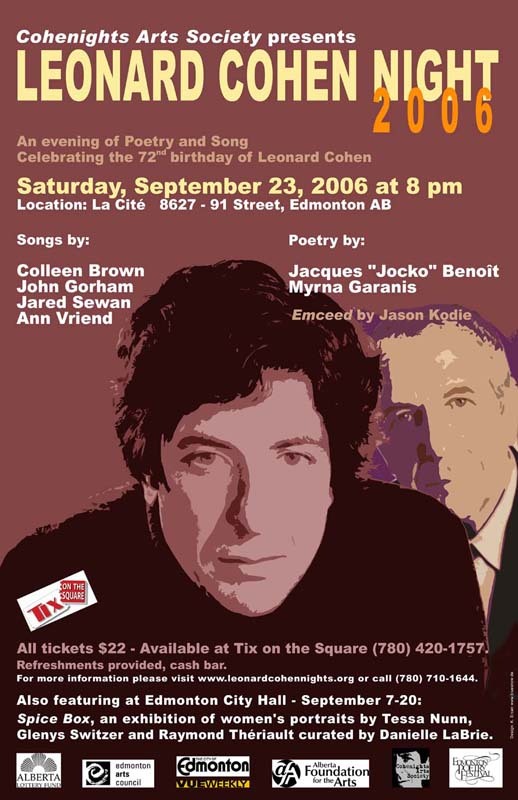 Cohenights Arts Society -a non profit association- has been introducing the works of Leonard Cohen to a whole new generation of Alberta Cohenites since 2002, allthewhile catering to die hard fans - and folk music connoisseurs. Our September 23rd line up is definitely 'top notch' and La Cité francophone is most intimate and effective as a folk venue.